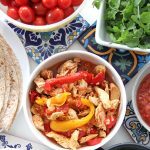 These Slow Cooker / Crockpot Chicken Fajitas are easy and delicious! Serve with all of your favourite toppings. Then use the leftovers for Fajita Soup. This past weekend I came home from a fantastic girls trip to dinner simmering away in the crockpot. My husband made dinner with the crockpot! The crockpot. I was shocked and super impressed. My husband is very adventurous in the kitchen and isn’t afraid to cook and try new things, which I adore, but I just never imagined him using the crockpot. And honestly it set my heart all a flutter! I mean obviously it’s not hard to cook with the crockpot, but I was pleasantly surprised…this was a really nice thing to come home to! 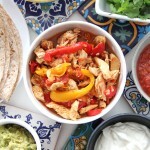 He made Crockpot Chicken Fajitas that were so delicious that I had to share the recipe with you. He even used my recipe for homemade taco seasoning for these fajitas, and made homemade guacamole…what a man! It was a delicious dinner! 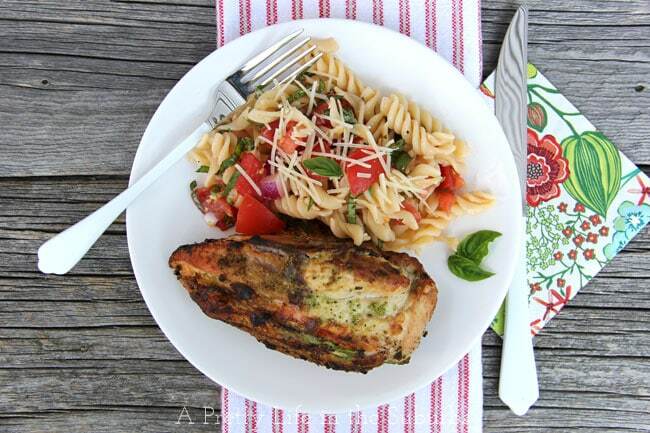 This would be a perfect weeknight dinner…they’re easy to prepare and very healthy. 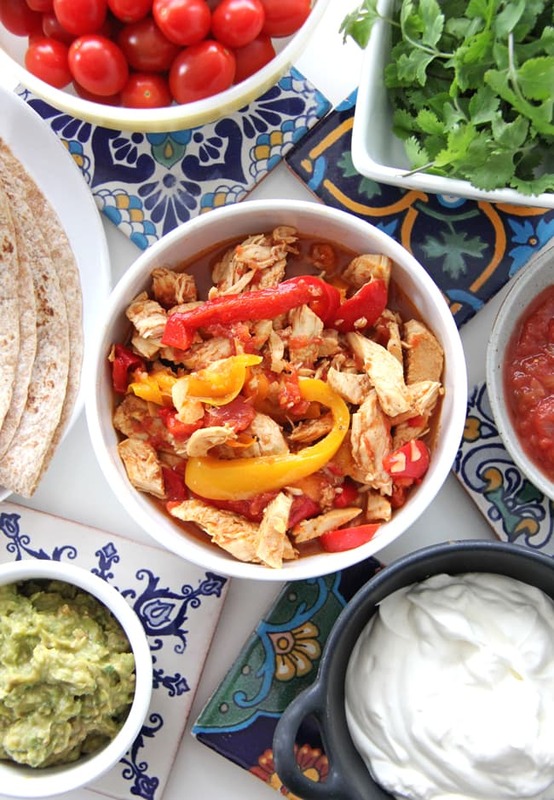 Serve the fajita chicken with soft tortillas, guacamole, sour cream, salsa, shredded cheese and fresh cilantro. Such a delicious dinner! Place 1/2 of the sliced bell peppers, 1/2 of the onions and 1/2 of the garlic to the crockpot. Add the chicken, and season with 1/2 of the taco seasoning. Add the remaining peppers, onions and garlic. Sprinkle on the remaining taco seasoning. Cook in your crockpot for 3 hours on high. When the chicken is cooked, use a fork to separate the meat. 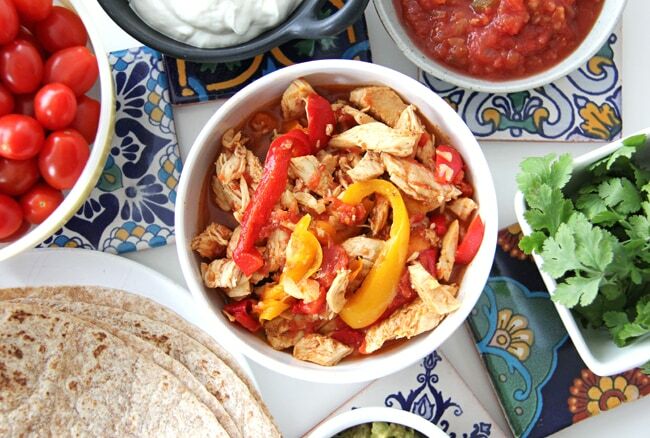 Serve the chicken fajita mixture with all of your favourite fajita toppings. 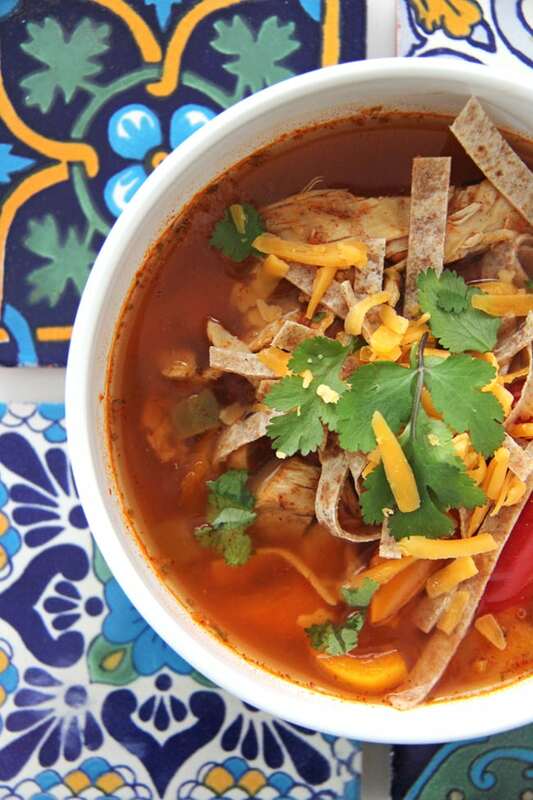 If you end up with leftover chicken, you can use it to make Fajita Soup the next day! 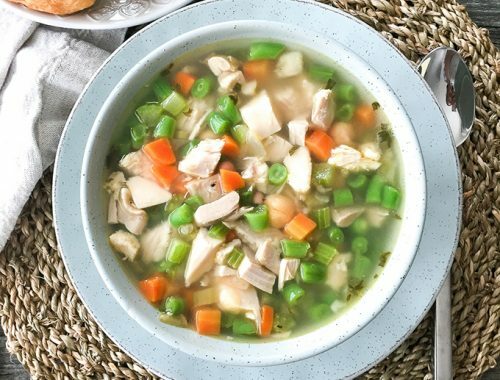 Just add some chicken or vegetable broth, extra taco seasoning to taste, some chopped vegetables if you like, then you have another meal for lunch or dinner. 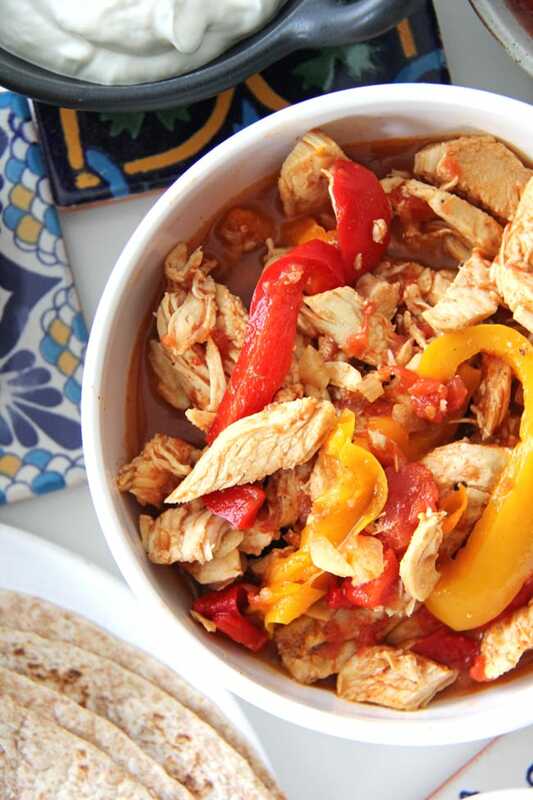 Serve it with sliced tortillas, shredded cheese and sour cream…SO good! I’m loving my new Breville crockpot, which is making our meal times easier than ever, so I’m going to be sharing more crockpot recipes with you over the next few months! Stay tuned! Also, if you’re looking for more crockpot recipes, you should check out my Crockpot Pinterest Board! Yum! I’m going to try these this weekend!